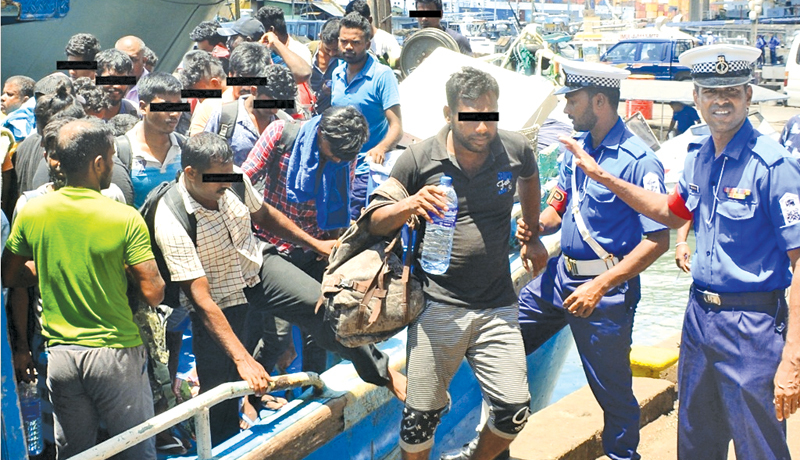 Navy personnel helping the illegal immigrants at the Colombo harbour. The Navy foiled an attempt by 90 Sri Lankans to sail to the Reunion Island yesterday. Navy Spokesman Lt. 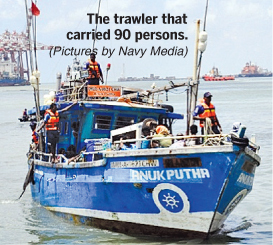 Commander Dinesh Bandara said, personnel attached to a Fast Attack Craft belonging to the Western Naval Command, during their patrol to curb transnational crime in the territorial waters nabbed the 90 suspects on board a suspicious trawler plying in the Western seas off Sri Lanka. “Having spotted a suspicious trawler about 40 nautical miles west off Negombo, two Fast Attack Craft on patrol went to the location. Naval personnel were able to detect 90 illegal Sri Lankan immigrants aboard who were heading to the Reunion Island. Among the suspects were 89 men and one woman”. During the initial inquiry it was revealed that these persons were residents of Batticoloa, Thoduwawa, Udappuwa, Chilaw, Mannar, Ampara and Matale,” he said. The Navy had later brought the suspects to the Colombo harbour and administered them with first aid and other medical treatment. The apprehended group was handed over to the Harbour Police, Colombo for further action.